Mega Man games are in a slump this year, but that by no means implies the franchise is dying. Look no further than the Blue Bomber's successful venture with Archie comics; proof, alone, the brand is still relevant and financially viable. Issue #7 is already in the works, marking the second to last issue in the "Time Keeps Slipping" arc. Once again, Patrick "Spaz" Spaziente is penning the cover, featuring Mega about to go at it with Oil Man and Time Man. From the looks of it, Spaz has managed to retain Oil Man's original Japanese color scheme, altered out of censorship for Mega Man Powered Up's international release. Of course, this could only apply for the cover and not the pages within. Eh, we shall see! Solicitations for this issue have not been disclosed, so we've no word on a release date, price, and plot synopsis. That info is likely forthcoming but it shouldn't be too hard to infer these details. Don't know about you, but I am thoroughly enjoying the Archie series thus far... leaps and bounds ahead of Dream Wave's previous efforts. This one's a keeper! >Implying the DreamWave comic was bad. I wouldn't say bad... just, uh, "okay." Yes it was bad they took a concept as simple as Mega Man is a helper robot who fights Dr. Wily and turned into a super hero high school drama. Let's not even forget the only Robot Master from the games was Heat Man. I actually thoroughly enjoyed the DreamWave Mega Man comics. It wasn't bad at all. I was sad they never got to make the X arc they teased us with at the end of the fourth issue. "Time keeps slipping" XD not "sleeping"
"Time Keeps Slipping" Part Three: Mega Man's search for his kidnapped sister and clues to clear Dr. Light's name is coming up with nothing. And Dr. Wily is still at large! Maybe he can save the day with the help of the six Robot Masters! Or are the robots wandering right into Dr. Wily's latest trap? BAAAW IT'S DIFFERENT, SO IT MUST BE BAD. Oh wait, that's how the megaman fandom reacts to everything. And let's not forget that it only went on for 3 or 4 issues, and was stopped because the fanbrats bitched about it beyond belief so it never got the chance to truly flesh out. It was quite decent, and the school stuff gave it some moderation. I haven't gotten a chance to read the Archie ones (because not one store in this whole city carries them), but I'm sure that if the DreamWave one was all fighting and nothing else, like the people bitched and wanted, they'd have bitched about it making Megaman seem "too fighting oriented and not showing his peaceful side". So shut your yap, and give credit where it's due. Dreamwave's comic might have done better were it not for DW's trademarked delays. It turned an ongoing series into just 4 issues. As an ongoing, building up to legit RMs might have worked. As 4 issues only it left much to be desired. Hahaha no you've done no research the comic stopped because Dreamwave Publications filed for bankruptcy and was subsequently disbanded. I honestly was too skeptical to get the Archie comics version, but my brother subscribed and let me read em. I have to say, man was I wrong to worry! I like it tons more than the DreamWave one. What happened to the Robot Master Field Guide story Protodude? Has the date changed again within the space of a day? Eh, my reservations about Dreamwave's comic aside, I will definitely say that Archie's version has been surprisingly good (I say surprisingly, because I've seen what they've done to Sonic in the past). At least for the time being, the comic license is in good hands. I think Ian Flynn's been doing a mighty fine job of writing this comic. 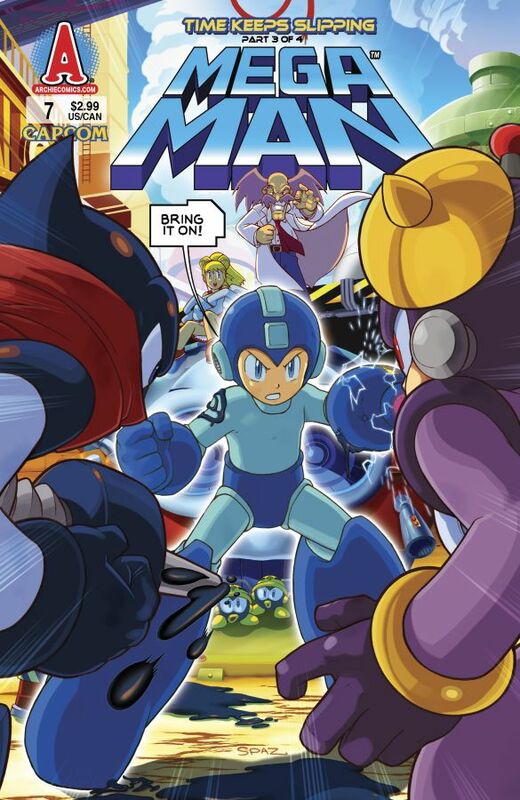 Hell, I don't care anyone who says things too negative on Megaman's failure towards Capcom, or what the hell this Dreamwave thing that everyone's talking about, but at least I'm happy enough that Archie's still keeping promises and continuing my favorite blue bomber's comic. Just can't wait for the new issues! I was doing good, acepting the fact that The Spaz couldn't work on every MM issue, but after seeing this, I'm willing to BEG for The Spaz to work full-time on this. I am a bit worried about the new artists, though after seeing Ben Bates's work on the Villain Variant covers for issues #3 and #4 (Fire Man and Ice Man), I'm hoping that Ben will end up doing more on this series. I would ask for Tracy Yardley!, but I don't think the Soni comics could function without him for long. Hey Protodude, you've heard of the band, 'The Proto Men' right? Story. Now. I will not stand for this after Legends. Anon: The Protomen stuff is all fake. They've confirmed the letter to be doctored. Ben Bates didn't do the Iceman Variant, Jamal Peppers did.